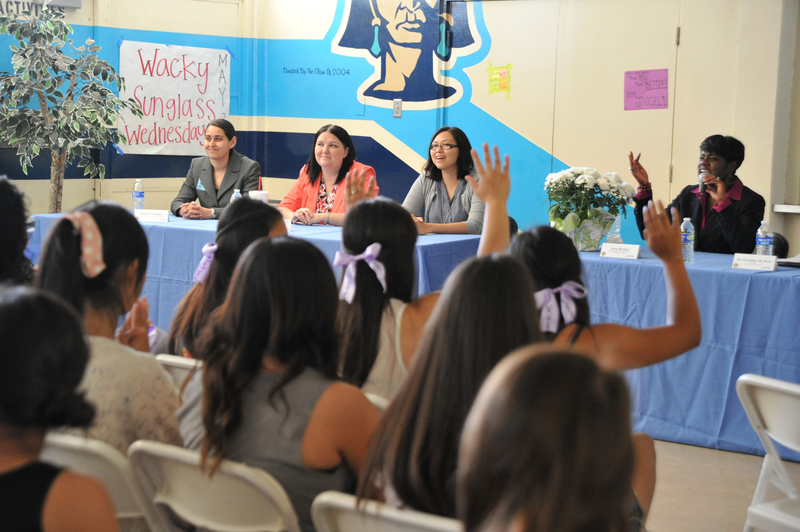 AZUSA, Calif. â Aug 5, 2014 - Northrop Grumman Corporation's (NYSE:NOC) Azusa campus recently hosted two Women Empowerment Panels at local high schools that featured female professionals with diverse backgrounds and career paths. The sessions were held at Azusa and Gladstone high schools and reached a combined audience of more than 250 female students. At the events, students learned how to overcome obstacles and negative messages to achieve their personal and career goals. "As technology continues to fuel our economy, the jobs of tomorrow will require a workforce with more advanced degrees in the sciences and engineering," said Anne Ostroff, vice president of Northrop Grumman's Azusa Operations. "It is important to ensure that this generation of young women is not left behind. Reaching out to them at a young age may be the catalyst they need to explore careers in technical fields." The panelists consisted of successful women from engineering, finance, education and human resources. They engaged and challenged the students to thrive in their environment through empowerment and to recognize themselves as future leaders. Students listened to the panelists as they talked about their personal experiences and the key role models in their lives who influenced them to strive for excellence. The panelists encouraged the students to make their voices heard, step out of their comfort zones and to make their education a priority. "Participating on panels that support our next generation of women, like the ones hosted at Azusa and Gladstone high schools, makes me proud to be a Northrop Grumman employee," said Gladstone panelist Anisa Rashad, manager, organizational effectiveness. "Everyone can be a leader. Leadership is a choice, not a rank." Panelists represented Northrop Grumman, NASA's Jet Propulsion Laboratory, Trash for Teaching and Citrus Community College. The Women Empowerment Panels were sponsored by the Asian Pacific Professional Network, an all-inclusive Asian Pacific American employee resource group at Northrop Grumman that is committed to fostering leadership through networking, professional development and community outreach.